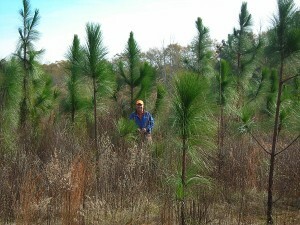 Podcast #224 – If You’re Serious About Longleaf Pines . . .
We told you last week about our approach to longleaf pines here at Longleaf Breeze. Think of this week’s program as Longleaf Pine II. We are delighted to welcome my brother Dave Borden as our guest today. Dave will be the first to assure you that he’s not a professional forester, but by virtue of years of experience and quite a lot of research, he’s the smartest person we know about longleaf pines. Listen as Dave lays out the steps he takes to prepare for planting longleaf pines and the importance of keeping their competition in check. Here’s Dave standing among longleaf pines he planted five years ago. You can tell he really is a “native grass nut.” His careful husbandry works. The longleafs we plant in the forest would be about 1/3 this size after five years. 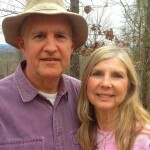 Here’s the link to the Longleaf Alliance that Dave described when we talked.